The Ester HS grade product is a Bi-axially oriented transparent polyester film (co-extruded layer with special copolymer) with one surface being heat sealable. The special copolymer layer is designed to heat seal on itself as well as with substrates such as A- PET, C-PET, modified C-PET & A-PET coated boards. 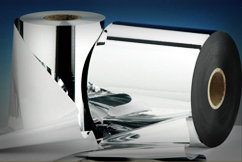 The film exhibits excellent strength and dimensional stability at high temperatures. Providing the correct heat seal properties is critical for achieving good pack integrity. The films typically have a wide operating (heat-seal) window and are very compatible when running through all types of packaging machines, such as Vertical Form Fill & Seal (VFFS), Horizontal Form Fill & Seal (HFFS) and overwrap equipment. For more demanding pack types and sizes, Ester has also developed a high heat-seal strength product. This provides the hermetic weld seal performance, making the film especially suited for heavier pack weights. This film is available in various versions viz. Corona treated, Chemical coated and/or with Metallization. It is available in the thickness range of 12 to 40 micron. As a transparent monolayer sealant with APET : For users who do not wish to apply sealant chemicals to films due to the challenges in such coating processes, the Heat Seal Film is a unique monolayer sealing solution for packing food in APET containers. This is typically used for fresh food where a long shelf life is not a requirement. The film can also be surface printed, if required. As an opaque barrier monolayer sealant with APET : For packages which do not require transparency, the Ester Heat Seal Film is provided with a high barrier metallised layer to provide protection and long shelf life to the food product. As part of a transparent barrier laminate structure with APET : The Ester Heat Seal film is also available with a unique anti-fog coating, which provides a shelf life of upto 12 months. The Anti-fog Heat Seal Film therefore provides both an aesthetic look, as the food product is clearly visible in addition to high pack integrity. The Heal Seal Anti Fog Film when laminated with a transparent barrier layer (like the Ester Transparent High Barrier Film Type EBD) provides a barrier packaging solution with a high shelf life. The barrier layer can also be reverse printed with a window opening to allow the product to be viewed. In APET trays as lidding film, laminated with barrier layers for long shelf life requirements like sausages etc. Monolayer packaging for Pie wrap, garlic bread, hot sandwiches etc.